Sharda University Result: Sharda University is a private university situated in the Delhi NCR region of India. It was established in the year 2009 by the Sharda Group of Institutions which is providing higher education since 1996. It is one of the largest educational groups based in Uttar Pradesh that has a large number of student and faculty member. It has 63 sprawling campus equipped with world-class infrastructure. More than 20000 students of more than 74 nationalities are enrolled in the university and studying under the guidance of 1200 faculty members. Apart from the campus in Greater Noida, university has two other campuses in the Agra and Mathura. University have 13 schools of education under which it offers around 216 programs including various Diploma, graduate, postgraduate and doctoral programs in different fields of study. Here in this article, students can collect necessary information about the Saurashtra University results that include the result dates, procedure to download the result etc. Admissions to Sharda University are made on the basis of the entrance exams conducted by the university and at the state level. University conducts a common entrance exam i.e. Sharda University Admission Test (SUAT) for admissions in the various university programs. For admission into the Ph.D. programs, university conducts a separate entrance test followed by an interview. Interested candidates can apply through the online mode from the university website. They can also get the application from the university office and university offices established at the various locations of India. After the registration process, university issue an admit card to the registered candidates. Admit card can be downloaded from the university portal. Students are advised to carry admit cards along with a valid ID proof and application fee deposit proof to the exam centers and candidates found without the any of these documents is not permitted to appear in the online exam. The academic session of the university starts in the month of July every year. University runs the program under a flexible Choice Based Credit System (CBCS) & semester system (Odd and Even semester) and thus the end-term exams are conducted on a semester basis i.e. two end-semester exams a year. The Mid-Semester Exam (MSE) for odd semesters under most of the schools are conducted in the first week of October each year. The Mid-Semester Exams for all the even semesters are conducted from February to March. For summer term programs, the Mid-semester exam is conducted in June and the End-semester exam is organized in July month. The End-Semester exams are scheduled from November to December for odd semesters and from April to May for Even semesters. University also conducts a make-up examination and supplementary exam for students with backlogs and those who wants to improve their grades after the declaration of the results. The make-up examination for odd semesters is conducted in February. Students are issued an admit card before the commencement of the semester exams and it is mandatory to carry the admit card to examination hall on the day of exam. University do not allow students to write the exam without the valid admit card. University declares the odd semester result by the last week of December and even semester result in the last week of May. The result for summer term-examinations is announced in the month of July. SU announces the semester results only through the online mode. University students can check the result on the official website of the university. All the information regarding the exams and results are updated in the “News & Events” column of the homepage of the university website. All the students enrolled in the university are advised to visit the university website on a regular basis to get all the updates. The university semester result is published in a PDF sheet that includes the result of all the students. The result list includes the school, course, year, semester, name of the student, roll number, Paper ID, Subject code, Theory, and practical marks in internal assessment and university exams, total marks, grand total, percentage and result. After the declaration of the results, university shows the answer sheets and distributes the original mark sheets & related certificates to the students. Once the result is declared, university notify the students about the make-up examinations/supplementary and students willing to apply are required to fill the online application form within the stipulated time. 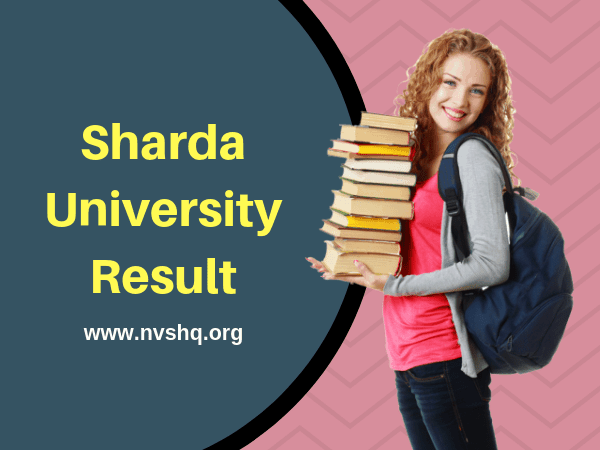 How to check Sharda University Result? Visit www.sharda.ac.in, the official website of the university. Click on the “Examination Results” link on the homepage. Select the respect result option. The result PDF appear on the screens. Download and keep it safe for further references.